^ "Truth (satya) implies love, and firmness (agraha) engenders and therefore serves as a synonym for force. 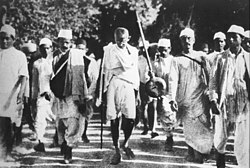 I thus began to call the Indian movement Satyagraha, that is to say, the Force which is born of Truth and Love or non-violence, and gave up the use of the phrase 'passive resistance', in connection with it, so much so that even in English writing we often avoided it and used instead the word 'satyagraha'...." Satyagraha in South Africa, 1926 from Johnson, p. 73. 'Satyagraha 100 Years Later', with Arun Gandhi from Democracy Now!